It’s that time of year again. People are committing to more gym time, fewer calories and a plethora of other goals that a lucky few will keep through February. A new year brings a fresh start, so why not use that fresh start to live better and experience more? 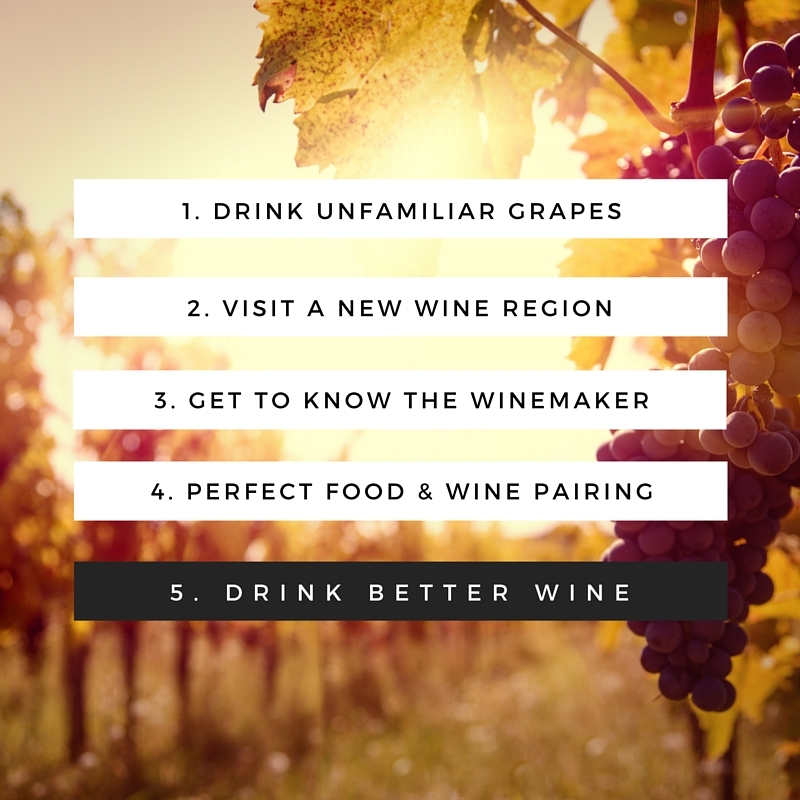 Our top five wine resolutions for 2016 are all about exploring, learning and upgrading, and they won’t break the bank! Check out our 5 Wine Resolutions for the New Year below. We cannot deny our love for classic Bordeaux and Burgundian varietals; but, the wonderful thing about wine is that there is always something new to try and learn. For that reason, we recommend branching out from your usual and trying something new – there are over 10,000 varieties of wine grapes in the world! Start out small by trying a 100% Pinot Meunier from Oregon (one of three grape varieties used to make Champagne) or Valdiguie (formerly called Napa Gamay) which is light, fruity and intensely floral. If you want to get really funky, head on over to Italy; they’ve got more varietals than one can keep track of! Sounds pricey, right? It doesn’t have to be. If you are capable of experiencing a new wine region that requires a passport, by all means, go forth and explore! If your time or budget is a bit tighter, explore some of the amazing up and coming wine regions right here in the U S of A. Missouri has the very first AVA in the country, Michigan is producing wines of finesse and elegance, and New York is pumping out great juice! Texas, Virgina, and Arizona all have wine regions worth the trip. Make use of our domestic wine production to expand your knowledge and palate! There are some very, very interesting people behind the beautiful juice you are drinking. These farmers, scientists, perfectionists, and experimentalists come from all different walks of life, but all have one goal: making a beautiful wine for their customers to enjoy. Stop by the winery if you can (they tend to tell amazing stories), utilize Google to check out their story, and get to know the people producing your favorite wines. Knowing their story makes the wine taste even better. Wine enhances food, just as food enhances wine; one of many reasons the French drink wine with most meals. Try taking your wine experiences one step further this year by pairing wine with your favorite meals, or vice versa. While there are many pairing rules that you can live by, we are proponents of drinking and eating what you personally like together. If you are looking for some direction, try cooking and drinking from the same place of origin. Think Coq au Vin with a Burgundian Red. This means something different for everyone, as it should. For us, it means skipping the mass produced juice and focusing on the artisan wine producers who take their craft very seriously. Pay an extra few dollars to taste the difference, regardless of price point. Go beyond what you find on your supermarket shelves – did you know there are more than 7,000 wineries in the United States alone? Chances are, you’ve only heard of a very, very small portion of them and there is so much more the wine world has to offer! If you don’t know where to start, reach out! We promise not to sell you on our wines, rather we want to help you learn to enjoy the vast world of domestic, boutique wines. What are your New Years wine resolutions? Let us know in the comments below, cheers!